In a bid to save some pennies for our imminent holiday, the other half and I have been trying to avoid too many indulgent nights out of late. 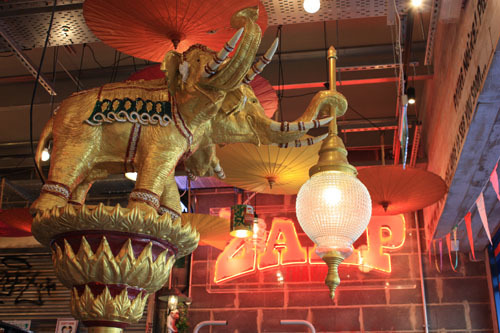 However, after hearing a lot of positive noise on social media about Newcastle’s new Thai street food restaurant Zaap, we decided it was about time we had a lapse in our self-control and give it a try. The restaurant is housed in the iconic former Co-op building next to the Gate that recently underwent a £17 million renovation. 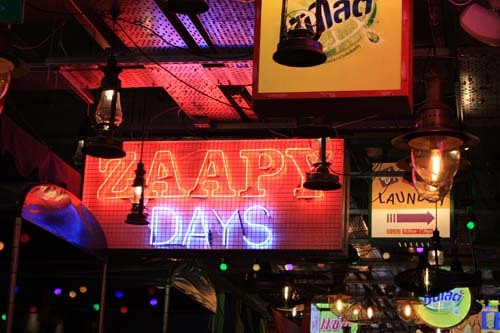 It officially opened its doors on 17 August, becoming neighbours to Cabana and Turtle Bay. As all of you fellow chef’s wives will know, a meal out with the husband can often involve a level of scrutiny that those of us lacking in culinary expertise would view a tad extreme. Our visit to Zaap was no exception as we approached the restaurant entrance and he quickly took umbrage to the hand written sign on the door stating the restaurant’s opening hours. Not a great start, let’s hope the food wasn’t going to disappoint. Once inside the greeting was immediate and warm, staff were relaxed and confident. We were led to a table of our choice past the busy open kitchen towards the back of the restaurant. 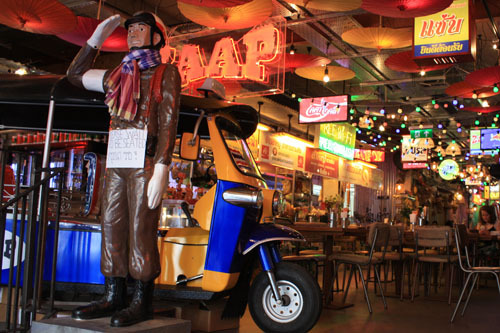 There’s so much to look at with bright neon lights, lanterns hanging from the corrugated iron ceiling and a plethora of trinkets from the Far East adorning the walls. 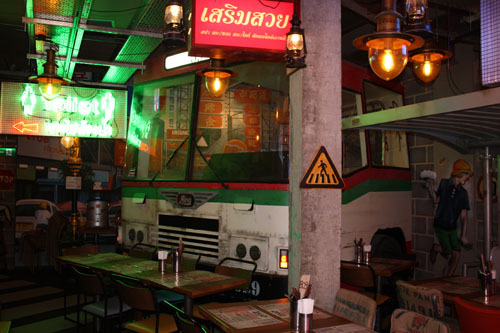 What the owners are clearly striving for here is the bright lights and heady atmosphere of Ko San Road, and although I have never been, I’m told by the husband that has, that it makes a pretty good replica. The menu, printed over both sides of a sheet of A3 paper, was full of roasted meats, stir fries, curries, noodles and soups and to someone less familiar with Thai cuisine was a little bewildering. However, don’t forget I’m with an expert, and not just of the culinary variety given he’s spent a lot of time in Thailand as he sought to remind me while we perused the list of dishes. Plus, there are handy translations below each option which he seemed to overlook. 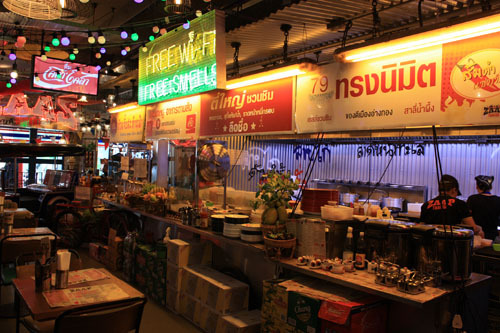 Alongside the food, there’s an extensive drinks menu that includes Thai beers and whiskies, not to mention a few unusual soft drinks, like bubble tea (Taiwanese milk tea served with tapioca balls), Ma Toom (Bael fruit juice) and An Chan Soda (butterfly pea juice with soda). After ordering a glass of red wine and a bottle Beer Lao, much to the appreciation of my other half who fell in love with the tipple whilst travelling and reckons it’s a scarce larger find in the North East, we set the ball rolling with a couple of starters to share. Moo Yang are grilled strips of pork on a skewer with sesame seeds, tender with a slight extra bite to them, seasoned to perfection. They came with a mildly spiced dipping sauce, and coupled with a generous portion of edamame beans, made for a tasty and not too heavy introduction to the main event. Service, though speedy and attentive, wasn’t totally flawless yet. We had to ask for some kind of vessel to dispose of the edamame pods and my partner’s request for a glass for his Beer Lao resulted in the delivery of an extra glass of water. Still, given the quality of the starters both issues were easily forgiven. Mr. Chef then opted for Moo Gang Panaeng (Pork in rich panaeng curry with lime lives) while I went for Gai Pad Kee Mao (spicy stir fried rice noodles with chicken, basil and vegetable). Both of which thankfully succeeded in hitting the spot. His curry came with an impressive sandcastle of rice and to my relief was a hit. Perfectly cooked pork, with a tangy and flavorsome sauce, that was just the right amount for his man-size stomach. My noodles were equally delicious with succulent chicken strips and stir fired vegetables that retained just enough of a firm texture – you could taste the basil in every bite. Unusually, both meals came presented on a round tin tray which I’m told was another authentic feature of my Far East dining experience. With regards to value for money it’s another “yes from me”, with the total bill for two starters, two mains and a couple of drinks each coming in just under £40, meaning we didn’t make too bad a dent in the holiday fund. 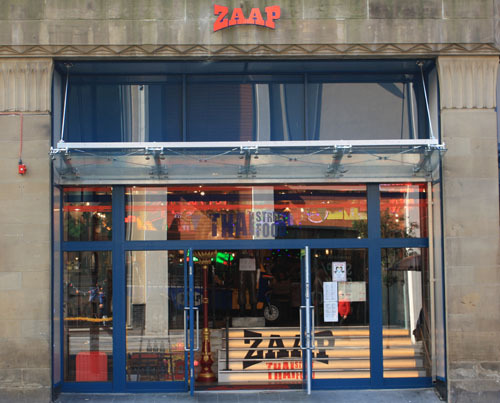 It’s fair to say that there’s nothing quite like Zaap in Newcastle. The breadth of the menu, coupled with the eclectic decor makes it one of a kind. 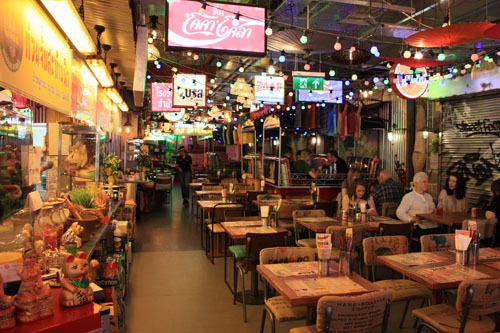 It may not be 100% authentic, but they’ve certainly gone all out to bring a slice of Thailand to Newcastle, and the result is a colourful, chaotic representation of the Thai street food scene.